A group of Conservative MPs including Jacob Rees Moggs have joined forces with the DUP’s Nigel Dodds to formally propose that Brexit be delayed until May 22. They have tabled an amendment to the motion planned by British Prime Minister Theresa May later this week. Their amendment states that this will allow businesses time to prepare for the operation of tariffs. Significantly the date chosen coincides with the start of the European elections. Mrs May was defeated in a Brexit vote this evening on her plans to leave the European Union, by a 149 majority. MPs voted against Mrs May's amended Brexit deal by 391 to 242 as her last-minute talks with EU chiefs ultimately proved fruitless. The hoarse prime minister said that she "profoundly" regrets the decision and continues to believe that the best outcome by far is an orderly exit with Brexit. She said she is passionate about delivering the result of the referendum and is equally passionate that the best way to leave is with a deal. 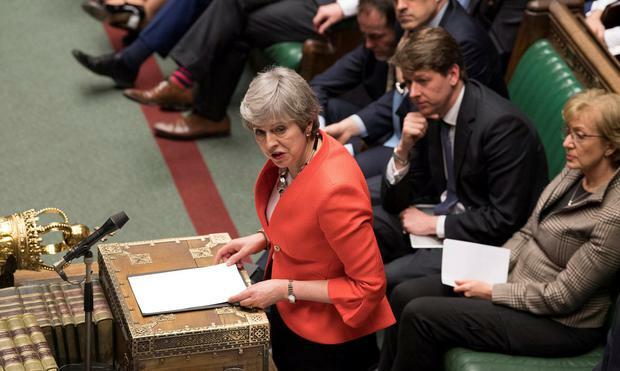 If the House of Commons declines to approve a no-deal Brexit, a vote on extending Article 50 will take place on Thursday, said Mrs May. Labour Party leader Jeremy Corbyn said that it was now time for a general election. Mrs May will reveal how her government intends to deal with the border between Northern Ireland the Republic tomorrow ahead of yet another vote on her approach to Brexit. Speaking after her deal was rejected again tonight Mrs May said: "This is an issue of grave importance for the future of our country." She said that unless a deal is approved by the House of Commons the "default" will be that the UK crashes out with a deal. In preparation for such a scenario, Mrs May has promised to reveal details of the tariffs that will be applied to goods from the EU in the event of no-deal tomorrow. She also said a plan is being prepared for how to deal with the border in Ireland. This will be carefully watched by the DUP and other MPs who are vehemently opposed to the backstop. The Prime Minister has repeatedly committed herself to avoid a hard border. Following the publication of document on no-deal, the House of Commons will be asked to vote on whether it wants to leave without a deal. Mrs May said: "The deal we’ve negotiation is the best and only deal available." Tanáiste Simon Coveney has said a crash out Brexit looks closer now than it did a few hours ago as he insisted the focus must remain on London where the crisis is. He said he is "deeply disappointed" with the outcome of the meaningful vote in Westminster tonight. Avoiding a crash out Brexit cannot be done without the UK parliament "agreeing something" he said, adding a no deal would be a "lose, lose, lose" scenario for everyone. Ireland and and the EU has worked over the past number of months to try to offer the "flexibilities and the assurances and clarification that the British government were looking for in order to get this deal ratified". "It hasn’t been possible to do that this evening. So the onus is now on the British government and the British parliament to come up with solutions," he said. "I think the British Prime Minister outlined very clearly this evening that the parliament in London faces hard choices now." "The focus has to be on London. That’s where the crisis is. That’s where the problem is and that’s where the solutions need to come from," he said. The House of Commons' second rejection of the EU-UK Brexit deal has "significantly increased" the risk of a damaging "no-deal" divorce, a spokesman for European Council President Donald Tusk said. "We regret the outcome of tonight's vote," the spokesman said. "On the EU side, we have done all that is possible to reach an agreement ... it is difficult to see what more we can do." "With only 17 days left to 29th March, today's vote has significantly increased the likelihood of a 'no-deal' Brexit ... Should there be a UK reasoned request for an extension, the EU27 will consider it and decide by unanimity." Yesterday, Mrs May rushed to Strasbourg to agree legally binding assurances with European Commission President Jean-Claude Juncker. It was a last-ditch bid to save her withdrawal agreement, days before the United Kingdom is due to leave on March 29. May had announced three documents - a joint instrument, a joint statement and a unilateral declaration - which she said were aimed at addressing the Irish backstop. The European Research Group said its verdict was that the assurances did not deliver legally binding changes to the Brexit deal or the backstop, nor an exit mechanism over which Britain had control. However, Britain's attorney general, Geoffrey Cox said the assurances Mrs May had been given still meant the UK could be locked in the bloc's orbit after Brexit. "The legal risk remains unchanged," Cox said. "However, the matter of law affecting withdrawal can only inform what is essentially a political decision that each of us must make." Earlier, EU's chief Brexit negotiator Michel Barnier said that Britain will not get a post-Brexit transition period unless the House of Commons ratifies the divorce package. "Listening to debate in House of Commons: there seems to be a dangerous illusion that the UK can benefit from a transition in the absence of the Withdrawal Agreement," he said said on Twitter. "Let me be clear: the only legal basis for a transition is the WA. No withdrawal agreement means no transition." The Brexit spokesman for Northern Ireland's Democratic Unionist Party Sammy Wilson told Reuters that Mrs May must go back to the EU after she loses the vote on her deal to demand radical change to her Brexit deal. "We need radical change .... and we need to see some steel in her stance," he said. Wilson said the DUP decided to vote against May's deal as soon as they read the legal advice by Britain's attorney general, which, he said, showed nothing had changed after Monday's revisions to the deal.